The only thing I find surprising about this sign is that his forearms aren't covered in tattoos. But more on topic, whatever is the function of the lone word POLICE in the lower right? Dan Flores, a General Motors spokesman, said the automaker believed the safety benefits cannot be understated. It adds, "This expression is frequently fumbled." I respect that this should not deteriorate into a stupid-signs post, but sometimes overspecification can produce a similar jarring result. A local discount store had a sign on its door that stated "NO LIVE PETS ALLOWED." I wish I had a photo to share. Christopher: It looks to me like something has been photoshopped out between the DON'T DO IT on the left and the POLICE on the right. Maybe whatever it is could answer your question. A couple of people in the original thread on Facebook have seen the sign IRL. Maybe we can get a pic of the original. Because of the policeman's hat style and the spelling of Offence, I assume this sign is some British country. Wonder if I am right. The sign's bottom half previously appeared 6 months ago (9:08 AM – 23 Mar 2014) on West Yorkshire Police Dog Section, WYPDogs, https://twitter.com/WYPDogs/status/447766946663395328, whatever the number of payments since then. @Faldone: I think that's just a reflection in the glare. I wonder if one could successfully defend a prosecution brought for taking gasoline without payment by pointing out the presence of signage threatening arrest if you paid. To let you know that's where the message is coming from. In case the Police Warning at the top wasn't enough. To take the comments a little further OT I've seen a number of (usually home-made) signs reading 'Blind dogs only'. To return to our muttons, I wonder if this is sign is actually produced by the police, or by the petrol (gas) station? The copper in the picture looks a little too threatening, and they'd probably include the actual name of the force, not just 'POLICE'. @Brett. Apparently you're right. The posters of the picture, who have seen it IRL, say it was that way in the original. Maybe the effort required to not boldly split that infinitive and so avoid the (to me) more natural 'to not make payment' got them all in a tizzy? Currently not allowed for UK police. Generally, tattoos have to be covered; and some – if intimidating, violent or discriminatory – will disqualify you from police emplyment even if hidden. The equivalent signs at my local gas station implore customers to "PREPAY FIRST." This is not the UK – they have not worn those helmets for decades. This is Canada. And Canada has chosen not to cease to abstain from refusing to leave the Commonwealth of the British Empire. Also interesting that one version of the poster describes not failing to refrain from paying as "THEFT" and the other as "FRAUD"
That extra not feels a lot to me like the "formal whom" encountered on defaced flags and other public announcements. Makes the sentence stronger, more authoritative, more serious. Negative concord is alive and well in this dialect of Official English. ITYM "you may or may not be unable not to read". @Deirdre: I don't recall ever seeing that helmet in Canada. Where is this sign from? There are two things I go into the building attached to a gas station to do. One of them is to make payment; the other is not. Any time I've left a site without (ahem) not making payment, it's been accidental. I once waited in line for half an hour at a gas station when an unusually large cluster of people were not making payments, because failing to do so would have been criminal. Even when I was a child, my parents would insist that I get out of the car at each gas station on a road trip, and it was never to make payment. So in other words, you go in either to make payment or to make a deposit. The original facebook post was made by someone from Bradford, and he claims to have seen it in the UK – most English forces do still use traditional helmets at least sometimes. By the colour of the badge it seems to be West Yorkshire Police – see http://www.westyorkshire.police.uk/sites/default/files/files/press-office/pic5.jpg. I am a bit surprised that it doesn't say that rather than just police. BUT – even if the sign made sense it still wouldn't make sense, because someone who couldn't pay because they hadn't checked they had their wallet would be *accidentally* failing to pay! richardelguru, to my British English ears, "not to make" sounds more natural than "to not make" (and I'm otherwise very happy to split infinitives). Levantine I actually swing both ways (at least on that). I wonder if it isn't British, and one step up from the "POLITE NOTICE" signs that I've often seen in the UK, and which I suppose rely for their effect on a cursory misreading. The sign doesn't say anything is legal, only that something is illegal; presumably it's also still illegal to deliberately not pay. An honest consumer doesn't want to accidentally not pay. So the logical way out is to pay accidentally. Indeed, is this sign directed specifically at the curious brand of thief who, in an effort toward plausible deniability, approaches the cashier ostensibly to pay but intentionally without his wallet? A bizarre situation; I'd love to be there, to see what his plan might be. Ok, so how would we simplify the remaining text so that it actually fits the straightforward concluding part? "Please make sure you can pay." 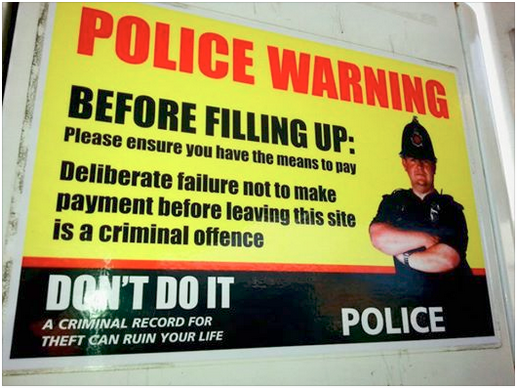 "Not to pay deliberately before leaving this gas station is a criminal offence." I think it is me who is wrong – a lot of Canadians weighed into the original thread but apparently the original is Bradford, UK. Apologies from an out of touch ex-pat. 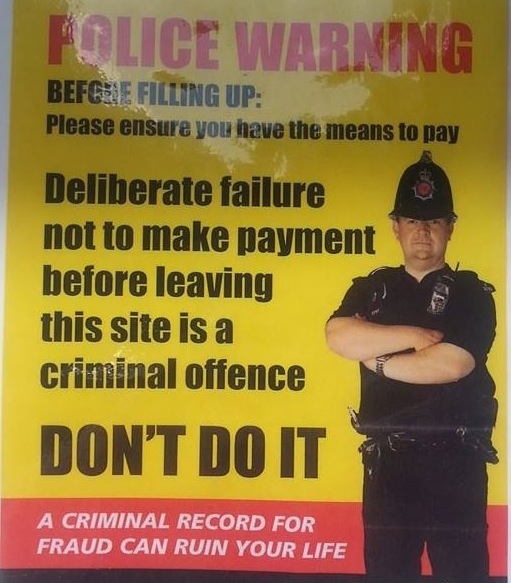 "A criminal record for theft can ruin your life"
Off topic, but I was mentally associating this kind of threatening warning with the US, so I'm a bit surprised that it's (supposedly) the UK. I personally find it rather distasteful. Is threatening wording like this common on signs in many countries?